Antagonistic roles of Nibbler and Hen1 in modulating piRNA 3′ ends in Drosophila In eukaryotes, aberrant expression of transposable elements (TEs) is detrimental to the host genome. Piwi-interacting RNAs (piRNAs) of ∼23 to 30 nucleotides bound to PIWI clade Argonaute proteins silence transposons in a manner that is strictly dependent on their sequence complementarity. Hence, a key goal in understanding piRNA pathways is to determine mechanisms that modulate piRNA sequences. Here, we identify a protein-protein interaction between the 3′-to-5′ exoribonuclease Nibbler (Nbr) and Piwi that links Nbr activity with piRNA pathways. 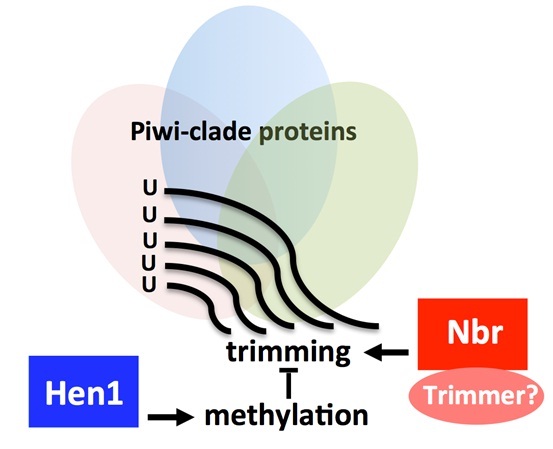 We show that there is a delicate balance in the interplay between Nbr and Hen1, a methyltransferase involved in 2′-O-methylation at the 3′ terminal nucleotides of piRNAs, thus connecting two genes with opposing activities in the biogenesis of piRNA 3′ ends. With age, piRNAs become shorter and fewer in number, which is coupled with the derepression of select TEs. We demonstrate that activities of Nbr and Hen1 inherently contribute to TE silencing and age-dependent profiles of piRNAs. We propose that antagonistic roles of Nbr and Hen1 define a mechanism to modulate piRNA 3′ ends. Quantitative ChIP-seq by adding Spike-in from another species. K Niu, R Liu, N Liu*. Bio-protocol DOI: 10.21769/BioProtoc.2981. Stable-isotope labeled metabolic analysis in Drosophila Melanogaster: from experimental setup to data analysis. Y Cai, N Liu*, ZJ Zhu*. Bio-protocol DOI: 10.21769/BioProtoc.3015. Systematic analysis reveals tumor-enhancing and -suppressing microRNAs in Drosophila epithelial tumors. Z Shu, Y Huang, W Palmer, Y Tamori, G Xie, H Wang, N Liu and WM Deng. Oncotarget 1;8(65):108825-108839. doi: 10.18632/oncotarget.22226.